Posted on June 19, 2006 by Alicia Bay Laurel	in Music. Singing is a combination of playing an instrument and storytelling, two of my other favorite activities. Singing focusses the mind in a manner similar to archery. If your mind wanders, you miss the mark and go off key or out of rhythm. 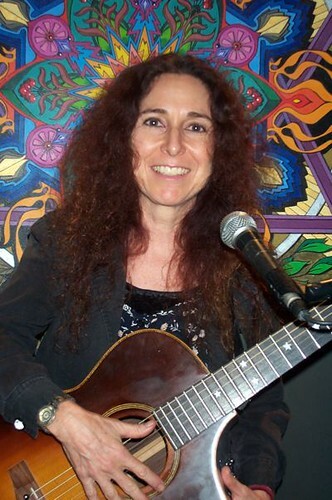 Singing conjures feelings and is therefore useful for releasing negative emotions (like singing the blues), as well manifesting courage when I feel fearful or passion when I feel apathetic. Singing comes in handy to entertain children and sometimes adults. People who sing together enjoy musical and social harmony. I can practice my instrument while driving my car or checking my email. Don’t have to check my instrument with baggage or stow it in the overhead. I have a very good reason not to smoke or eat stuff that gives me sore throats. I love a whole bunch of songs, some of which I wrote. There is no end to the possibilities for development of the voice, and if I forget that, I only have to listen to Bobby McFerrin. Posted on April 14, 2006 by Alicia Bay Laurel	in Music. 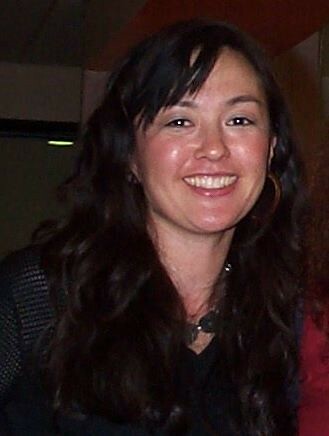 In January 2001, singer/songwriter/bassist Sachiho Kudomi was vacationing on the Big Island of Hawaii with her rock star husband, Donto, and their two young sons. While they were watching a performance of a hula dedicated to the goddess Pele at Hawaii Volcanoes National Park, Donto suddenly fell over, and was rushed by ambulence to the Hilo Medical Center. The next day he was pronounced dead from a brain anurism at 38 years of age. Sachiho decided that Pele wanted to keep him as her own. 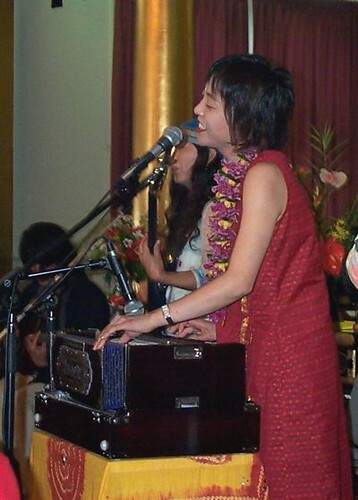 Sachiho returned to Hawaii Island a year later for a memorial service at the largest Buddhist temple in Hilo. 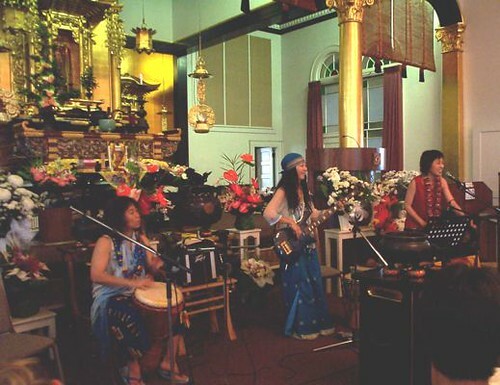 Several dozen of Donto’s fans flew over from Japan for the service, which featured a musical performance by Sachiho’s all woman trance music band, Amana. 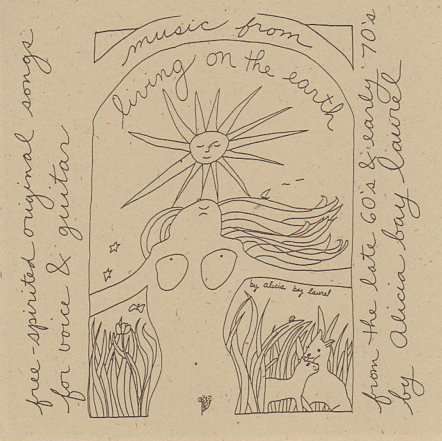 In between the times I recorded Music from Living on the Earth (January 2000) and Living in Hawaii Style (spring 2001) at Seawest Studio in Pahoa, Hawaii, Sachiho recorded a CD there with a world beat band, saw owner/engineer Rick Keefer’s copy of Music from Living on the Earth and recognized the cover of Living on the Earth. “Oh!” she exclaimed, “Very famous book!” Rick put us in touch by email, and the next thing I knew, I was organizing a Hawaii Island concert tour for Amana to follow the memorial service for Donto in Hilo. 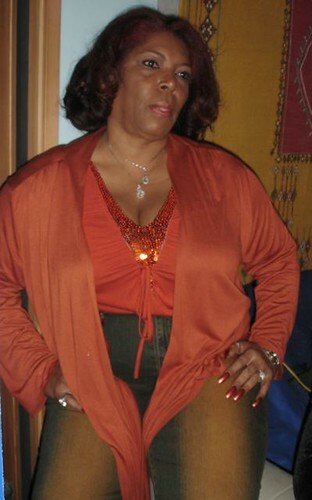 I had worked hard on the publicity, and we had large, enthusiastic crowds at every show. Hiromi, the percussionist, also invited Toshi and Masaha, the members of her other band, Dinkadunk, to play between Amana’s sets. 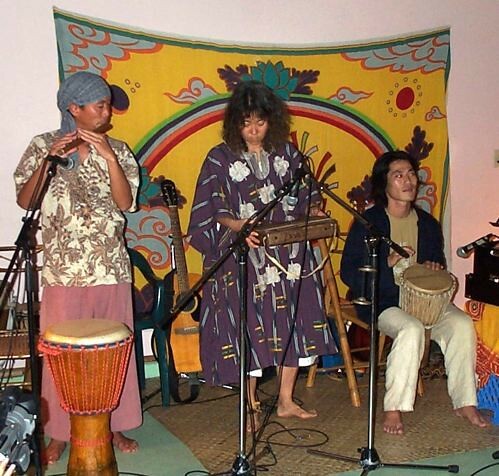 Hiromi learned to drum in Africa (and her daughter is half Zimbabwean). 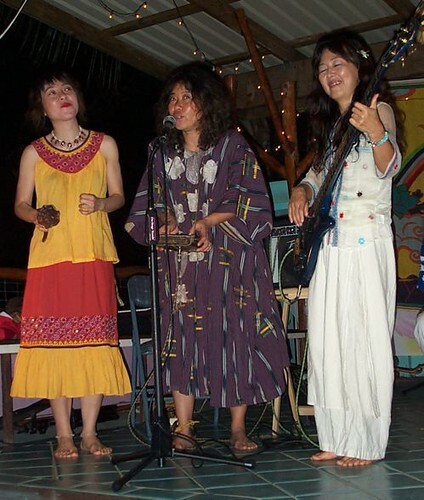 Yoko Nema sings and plays instruments from India, where she goes often to study Indian music and buy merchandise for Tata Bazaar, her gift store in Naha, Okinawa. About a dozen of Donto’s fans followed us from venue to venue, attending every concert. A couple of them brought their copies of Living on the Earth (Japanese edition) for me to sign. One night I performed one of my autobiographical story shows, and Toshi, whose interpreting skills are excellent, translated my entire show into Japanese for Donto’s fans as I was telling it. The three band members all brought along their beautiful, happy, elementary school age children, who never squabbled, screamed demands, complained they were bored, or refused to eat what they were served. For an entire week I observed these amazing children, harmoniously playing together or quietly playing alone, utterly unlike almost every single child I’d ever met in the USA. The band and their families stayed in a big rental home near the oceanfront volcanic warm ponds in lower Puna. When we traveled to the other side of the island, we camped out with friends of mine who have a botanical garden in Captain Cook. We had as much fun as friends can have together in a week’s time, making music together, laughing, sharing stories and meals. 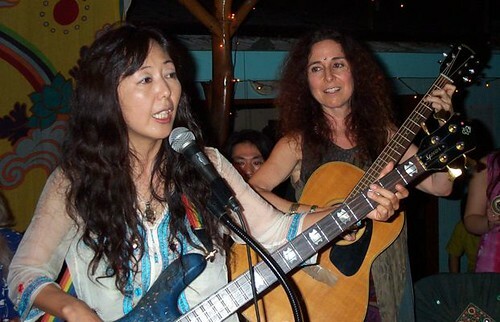 I am looking forward to traveling with Sachiho and her band again in Japan some day! Posted on April 5, 2006 by Alicia Bay Laurel	in Music. 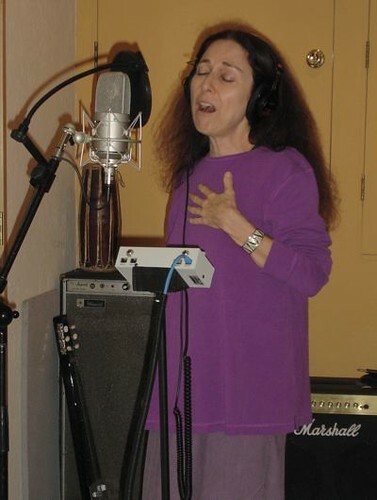 On November 20, 2005, at the recording studio of Scott Fraser in the Mount Washington district of Los Angeles, an amazing collection of musical minds collaborated in recording of my three original gospel style songs, “Doctor Sun and Nurse Water,” “Sometimes It Takes a Long Time” and “Love, Understanding and Peace,” for my CD, What LivingÂ’s All About, due for release in May 2006. Artist/photographer Hoshi Hana took all of these photos, except the ones of Scott and of Mari, which I took. 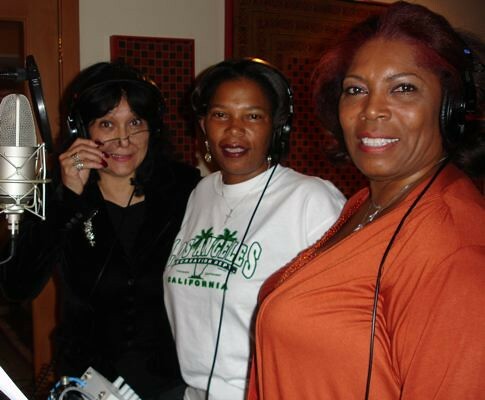 JessicaÂ’s choir on my CD includes her daughter, Vetia Richardson, and her friend Irene Cathaway, with whom she sings backup for Connie Stevens. We recorded the singers five times on each song to create the sound of a full choir. 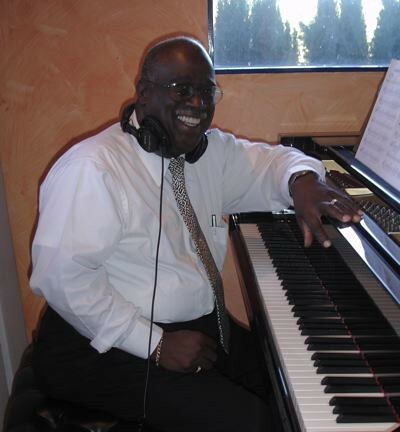 JessicaÂ’s gospel keyboard specialist, Reverend Harold Pittman. 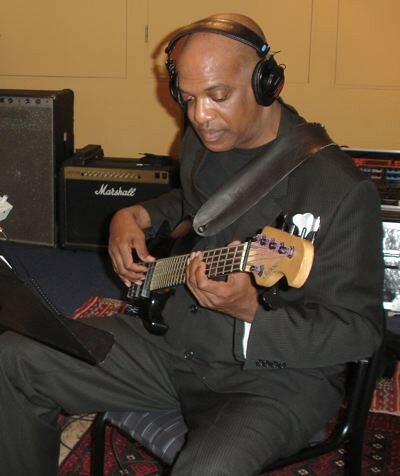 Our bass player, Kevin OÂ’Neal. Here I am, wailing with the band. 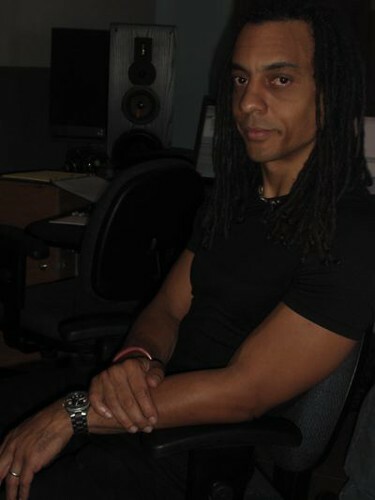 Ron Grant, my co-producer, works as a film composer. He made all of the music charts for the songs, collaborated on the arrangements and instrumentation, and sometimes conducted the choir. He’s got an Oscar and an Emmy on his shelf. 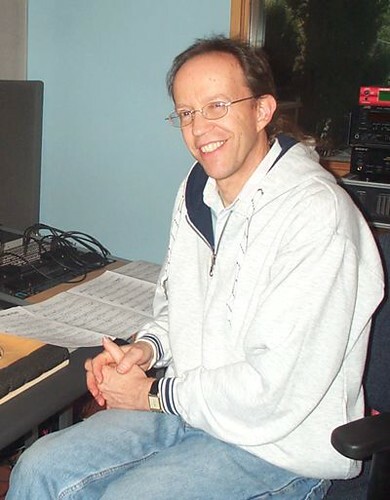 Scott Fraser, recording engineer and live audio engineer for the Kronos Quartet, worked with all of us from a viewpoint both technical and compassionate. 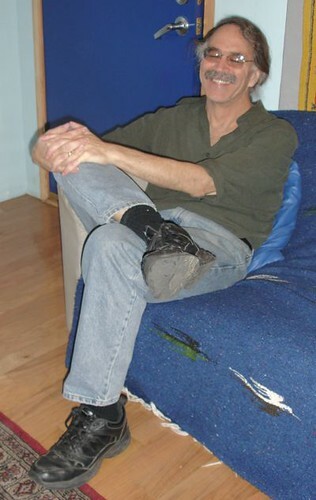 Scott was nominated for a Grammy in 2006 for a recording he co-produced. Our intrepid photographer, Hoshi Hana, creator of spiritually inspired photocollages and other amazing artworks.